Centrally located in Thame, surrounded by the major city's amenities, shops, banks and restaurants, this building enjoys an excellent location. It consists of offices furnished to a high standard and technologically equipped, provided with secretarial and reception services to offer you a professional working environment. 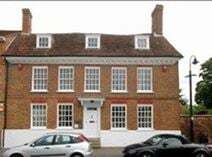 This is a unique opportunity of renting office spaces right in the heart of Thame. These stylish offices are available in various sizes and provided with air-conditioning, kitchen and numerous other facilities. They are surrounded by a variety of amenities and easily accessible.